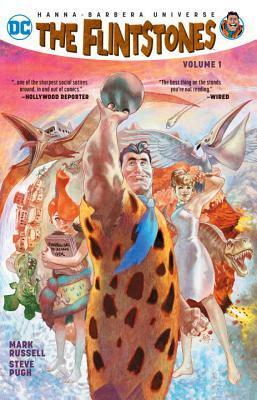 The critically acclaimed creative team of Mark Russell (PREZ) and Steve Pugh (ANIMAL MAN, SWAMP THING) set out to turn a beloved classic cartoon into a modern graphic novel masterpiece with THE FLINTSTONES VOL. 1, which collects THE FLINTSTONES #1-6. Mark Russell is an American author, best-known for his satirical graphic novel God Is Disappointed In You, an irreverent retelling of the Bible. He is also the writer of PREZ and THE FLINTSTONES for DC Comics.